Modern waterfront Leeds city centre hotel with a panoramic views from the rooftop Sky Lounge bar. 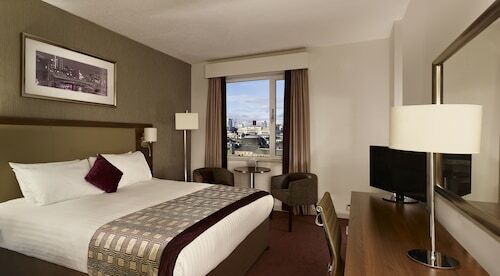 DoubleTree by Hilton Hotel Leeds City Centre stands on picturesque Granary Wharf, by the Liverpool Canal. It's a half-mile stroll to Trinity Leeds mall and the 18th-century Holy Trinity Church. The glass-roofed 19th-century Victoria Quarter offers high-end shopping in historical surrounds. Located in Leeds City Center, this hotel is within a 5-minute walk of Briggate and Leeds Grand Theatre. First Direct Arena and O2 Academy Leeds are also within 15 minutes. Leeds Station is 7 minutes by foot. This imposing Art Deco building fits in with the grandness of the City Square it overlooks. The Queens Hotel is right beside Leeds Station and a 6-minute walk from Kirkgate, Europe's largest indoor market. Guests can visit the nearby City Museum and Royal Armouries for a primer on local history. Located in Leeds City Center, this hotel is within a 10-minute walk of Holy Trinity Church and Leeds Grand Theatre. First Direct Arena and O2 Academy Leeds are also within 15 minutes. Leeds Station is only a 4-minute walk. 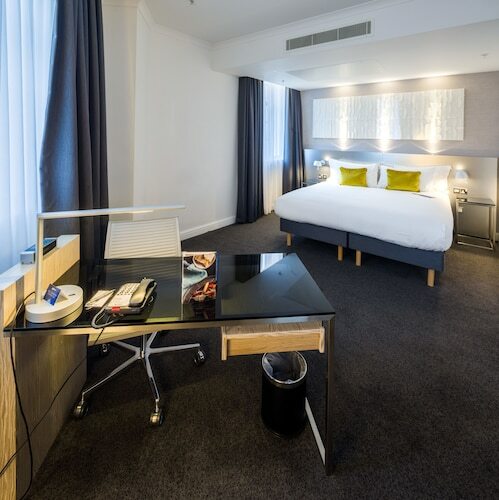 Located in Leeds City Center, this eco-friendly hotel is within a 5-minute walk of St. Anne's Roman Catholic Cathedral, O2 Academy Leeds, and Leeds General Infirmary. First Direct Arena and Leeds Grand Theatre are also within 10 minutes. Leeds Station is 7 minutes by foot. A 5-minute walk from Crown Point Shopping Park, Clayton Hotel Leeds is close to the motorway and a 20-minute drive from the airport. Guests can walk 10 minutes to Leeds Train Station, and just a little bit farther to the waterfront shops and restaurants at Brewery Wharf. 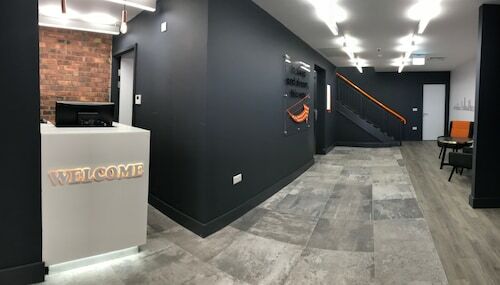 Located in Leeds City Center, this hotel is within a 15-minute walk of Canal Wharf, Leeds General Infirmary, and O2 Academy Leeds. First Direct Arena and University of Leeds are also within 1 mi (2 km). Leeds Station is 7 minutes by foot. 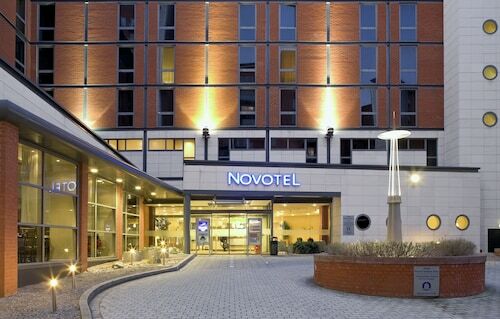 Located in Leeds City Center, this eco-friendly hotel is within a 10-minute walk of Leeds Dock and Royal Armouries. First Direct Arena and Leeds Grand Theatre are also within 1 mi (2 km). Leeds Station is 10 minutes by foot. 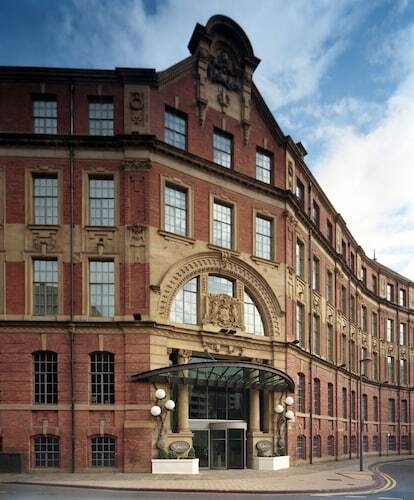 Located in Leeds City Center, this romantic hotel is within a 10-minute walk of Canal Wharf and Leeds Grand Theatre. Royal Armouries and O2 Academy Leeds are also within 15 minutes. Leeds Station is 5 minutes by foot. Located in Leeds City Center, this hotel is within a 10-minute walk of Leeds City Square, O2 Academy Leeds, and Leeds General Infirmary. First Direct Arena and Leeds Grand Theatre are also within 15 minutes. Leeds Station is only a 5-minute walk. 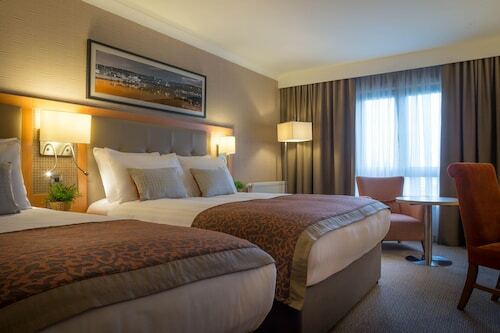 Opposite the train station and a 2-minute walk from City Square, the hotel is well-placed near the starting point of Yorkshire's White Rose Way. All the shops, pubs, and restaurants of the city center are also within walking distance, and Leeds Bradford Airport is less than 10 miles (16 km) away. Located in Leeds City Center, this hotel is within a 10-minute walk of Canal Wharf and Leeds Grand Theatre. O2 Academy Leeds and Leeds General Infirmary are also within 15 minutes. Leeds Station is only a 2-minute walk. Leeds Town Hall is certainly a destination worth seeing. You'll find it in Leeds, approximately 35 miles (56 kilometers) away from the major city of Manchester. Selecting the ideal accommodation is a key piece of any trip. If you want to set up camp near Leeds Town Hall, there are about 32 options to choose from. Several choices to think about are the Gateway Apartments, 0.8 miles (1.3 kilometers) away, the Quebecs Luxury Apartments, 0.2 miles (0.3 kilometers) away, and finally The Chambers - Park Place - Apartments, 0.2 miles (0.3 kilometers) away. 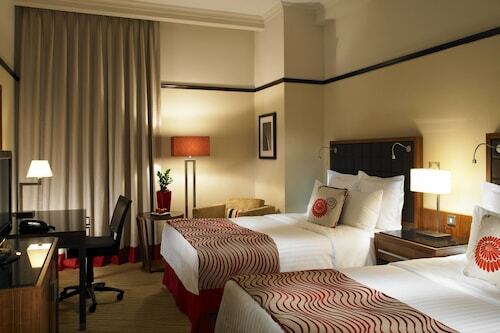 For professional service at a competitive price, consider a low-cost hotel. 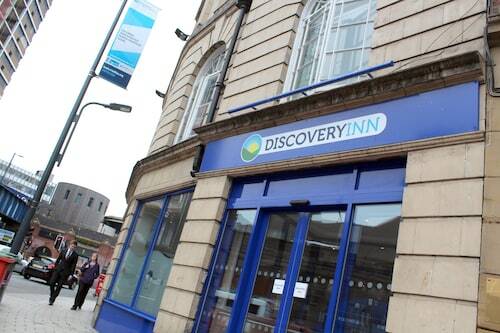 For instance, the Discovery Inn Hotel is 0.4 miles (0.6 kilometers) away, while the Roomzzz Leeds City is just 0.5 miles (0.8 kilometers) away. 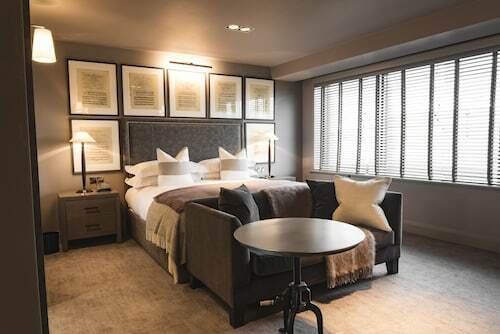 If you're the kind of person who collects vintage wine and prefers luxury bed linen, you'll appreciate the indulgent pleasures which are available at some of the high-end hotels nearby. A couple of fantastic choices are the New Ellington, a mere 0.2 miles (0.3 kilometers) away, or the Quebecs, 0.2 miles (0.3 kilometers) away. If you are feeling tired from your travels, treat yourself to a delectable caffeine hit at Tribeca City Café, just an easy walk away. Bellisimo is a fantastic choice that's close by if you prefer something substantial. Travelers who are looking for a beer or vino can pull up a stool at Direktors, also conveniently located within walking distance. Consider enjoying a visit to Oxford Place Chapel, a tranquil house of prayer and a local attraction. Readers, both avid and casual, shouldn't miss browsing the books and resources offered at Leeds Central Library, a popular local library. Ensure that you call first for visiting information. You'll enjoy some inspiration, as well as education, at Leeds City Art Gallery, which acquires, secures and exhibits pieces of art to help contribute to the local culture. Do you need a break from the hustle and bustle of the city streets? Go for a jog in Mandela Gardens, a leafy green sanctuary. Support the local arts scene and attend a play at Carriageworks. It's so simple to jump on a train when you're heading to Leeds Town Hall. The nearest station, Leeds Station, is just 0.3 miles (0.5 kilometers) away! How Much is a Hotel Room in Leeds Town Hall? Hotels in Leeds Town Hall start at $24 per night. Prices and availability subject to change. Additional terms may apply.